Graphical Presentation of Data (Infographics). Many years ago I was involved in a project to develop better ways of communicating numerical information, which we called, ‘graphical presentation of data’. We aspired to be like Florence Nightingale. I don’t think the word Infographic had been invented back then, so it’s nice to have something cool and hipster to describe what we were up to. An associate at the time was very concerned about the potential for the manipulation of data and its misrepresentation using graphics to “tell the story you want“. We never really made much progress and I think that some of the concerns that troubled us then are still evident. Some infographics I’ve seen are; biased, inaccurate, unethical or just badly put together. If you want a useful (and entertaining) description of good and bad infographics have a look at halfblog.net and the campaign against crap infographics (more links at the end of the post). Blue – deaths caused by diseases. The result was action to improve sanitary conditions which led to greatly reduced numbers of deaths. This article by Understanding Uncertainty provides a detailed explanation and helpful animation of the graphic. The significance for me is that Florence Nightingale was able to communicate a very important issue through the graphical presentation of hard evidence; the data. It has been suggested that this approach enabled Politicians and Civil Servants to understand the issue and take action. They would have apparently struggled to understand if the data had been presented in the format of tables or other statistical reports used at the time. Clear presentation which enabled understanding was the key to the success of Florence Nightingales’ Coxcomb. It is worth remembering that this was created over 160 years ago, and today the 1857 Coxcomb still sets a standard that many modern infographics could aspire to. 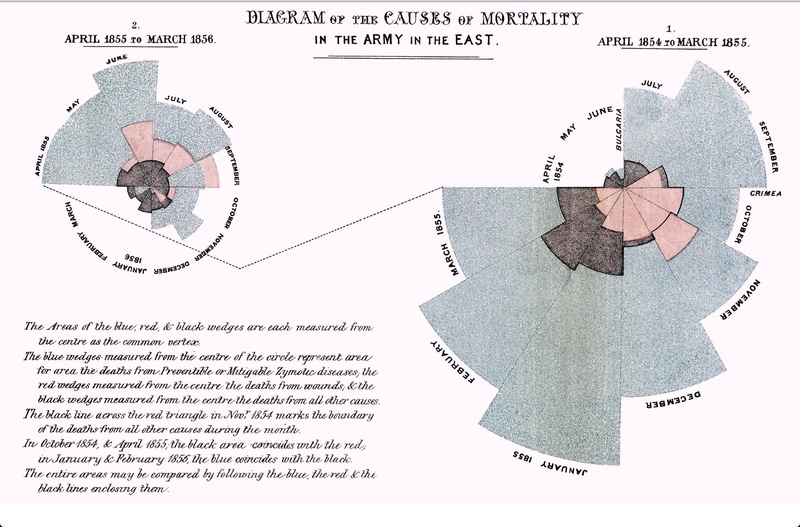 Florence Nightingale could in my view claim to be the mother of modern infographics. One last observation. Writing this post was partly prompted by reading this blog post from Ayrshire Health, and a very brief twitter conversation with Derek Barron (@dtbarron) about nursing research. The gist was around how some research is presented in a very academic way that can obscure understanding. That got me thinking about Florence Nightingale again, thanks Derek. 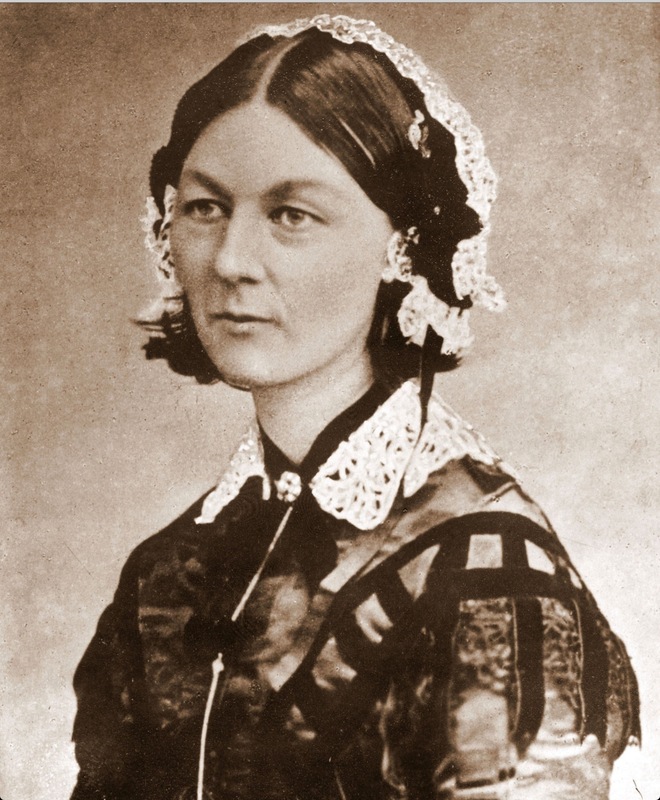 I’m not aware of how much the mathematical research and data presentation capabilities of Florence Nightingale feature in modern nurse research and communication training. In my view you’ve got a very helpful role model. The graphical presentation of data (aka infographics) has been around for long time. It is an effective and quick method of clearly communicating complicated information, and can have a huge impact. Like any method of communicating there are good, bad and terrible examples of infographics and how to use them. Be careful how you use a powerful tool. Was just about to tweet you. Interesting stuff! Really like how great some infographics can be in communicating complex data. Also really interesting to see what makes a dodgy infographic too – the link to the halfblog is quite an education! Fascinating blog with some real resonance for the work we do today. Thanks for a great read. It’s interesting how much of what appears new has very strong roots in the past. A really informative and fun read: thank you. I may start campaigning to reintroduce ‘Coxcomb’: so suitable for our Farm info. The coxcomb is a good graphic. Someone mentioned that it was difficult to create using software. To be honest I think a hand drawn one is a thing of beauty. I wrote a post last year on creating data visualisations, I thought you might like to see it http://louisebrown.org.uk/2012/03/07/creating-data-visualisations/. Have looked ad left you a comment.